The PT-104A is a four-channel, high-resolution temperature data acquisition module for use with PT100 and PT1000 RTD sensors. It can also be used to measure resistance (375 Ω and 10,000 Ω ranges) and voltage (115 mV or 2.5 V ranges). In PT100/PT1000/ resistance mode, the unit uses a four wire circuit. In voltage mode, the input connector can be treated as a differential input with ground, or two single-ended inputs. Both inputs must be 0V or above, though it does not matter which input has the higher voltage. For the 115 mV voltage range, the accuracy may vary by 2%, and the temperature coefficient will be 100 ppm/°C. Although accurate temperature sensors are widely available, it has been difficult to take advantage of them due to errors caused by the measuring device. The PT-104A, however, is designed to be inherently accurate. Rather than relying on voltage references (which tend to be temperature sensitive) it uses ‘reference’ resistors which are extremely stable (low temperature coefficient and drift). The exact value of each resistor is stored in an EEPROM to provide the ultimate in accuracy (yearly re-calibration is recommended). To achieve the 0.001°C resolution a highlyadvanced ADC is used that can resolve to better than 1 part in 16 million. The PT-104A measures temperature using platinum resistance temperature sensors (RTDs). Both common industry standards (PT100 and PT1000) are supported. The unit is compatible with 2, 3 and 4 wire sensors (4 wire PT100 sensors are recommended for accurate measurements). When measuring resistance, the unit uses a four-wire circuit to give the greatest possible accuracy. Two resistance ranges are available (0 to 375 Ω and 0 to 10,000 Ω). The unit is calibrated for 0 to 375 ? so this range should be used for accurate measurements. The new USB/Ethernet interface allows the logger to be used in a variety of situations: USB-only, USBpowered with Ethernet data, and Ethernet data with Power-over- Ethernet (PoE). Using the Ethernet interface, the PT-104A can be located anywhere on a LAN or on the internet. 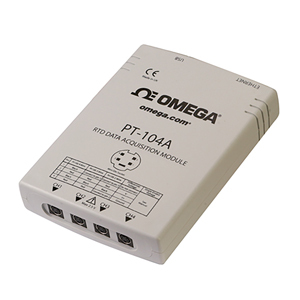 The PT-104A can obtain its power from the Ethernet port as a Powered Device (PD) according to the PoE standard. To use this feature, you must connect the unit to Power Sourcing Equipment (PSE) such as a network switch, router or power injector that also supports the PoE standard. Any standard Ethernet cable up to 100 m (about 328') in length can be used. The PT-104A is supplied with Windows Logging and Player Software. The software will automatically detect which sensor is connected and will display readings in the correct units. Also supplied is a software development kit (SDK). The SDK contains a range of software drivers and example code that you can use to write your own software or to use your PT-104A data logger with third party software. With the included Logging Software you can set the sampling interval from 1 second to several hours and set the maximum number of readings. You can also tell the PT-104A data acquisition module what do to when the temperature readings have been taken—either: stop; repeat immediately (start again); scroll (oldest recordings disappear); or repeat after delay (where the delay is set by the user). Multiple PT-104A modules can be used simultaneously with the logging software. Also, PT-104A modules can be mixed with TC-08 thermocouple input modules and used at the same time. Up to 20 units of any kind (PT-104A or TC-08) can be connected.Using the PT-104A logging software, data can be viewed in a spreadsheet and/or in a graph as it is being recorded. Data collected from previous recordings can also be viewed using the Player. (SP2 or greater), Vista, 7. Ethernet Port Conforms to IEEE 802.3 10Base-T.
Conforms to IEEE 802.3af Power-over-Ethernet (PoE). 참고: Includes USB cable, ethernet patch cable, 4 mating mini DIN screw terminal connectors, quick start guide, Windows software and complete operator’s manual on CD.